Mirah Belle introduces unadulterated, pure essential oils that improve the health of your skin, hair and body. These 100% Pure Essential Oils offer a variety of benefits from cosmetic, dietary purposes and are known for their healing effects mentally, physically and emotionally. 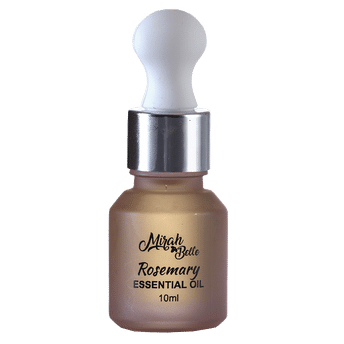 Mirah Belle's Rosemary Essential Oil has amazing health benefits. It stimulates hair growth, fights acne and is a natural astringent. It is suitable to be used on skin and hair. Rosemary essential oil for the hair: The rosemary essential oil is known to stimulate the hair growth. Not only that, it is also said to prevent baldness, slow the greying process and also help with dandruff and dry scalp conditions. Rosemary essential oil for the skin: Rosemary essential oil contains anti-inflammatory and antiseptic properties that are the worst enemies of acne. The rosemary oil is also known to be a natural astringent.